Most of the political debate around the NHS, certainly in the Leaders’ Debate on Thursday night, has focused on who should deliver NHS services. In particular, the anti-austerity parties, as well as the Labour Party, are extremely sceptical about what they call “privatisation” – the provision of NHS services by private companies. The FYFV also made it clear that without making the right sort of changes, and assuming funding levels stay broadly as they are over the next five years, the NHS will be under-funded to the tune of around £30 billion by 2020. Given the entire NHS budget currently stands at around £100 billion, that constitutes what some might call an existential threat. The document sets out various ways to meet that challenge. In short, NHS England thinks that with the right service reform and the introduction of these new models of care, it can make efficiency gains representing about £22 billion of the shortfall. But that still leaves £8 billion of extra funding. And this is where the political parties come in. They are the ones who make the decisions about where tax is spent on our public services. They have a choice as to whether they will listen to the NHS itself – which is effectively lobbying them to put in this extra funding – or whether they will prioritise other public services, or indeed whether they will simply spend less overall and give people more tax cuts instead. As you can see, only one of the major parties has actually listened to the NHS itself when it comes to the vital funding needed to maintain “a comprehensive taxfunded NHS”. If you believe in the value of such an NHS – one that doesn’t need to go cap in hand to private companies to provide vital services, or force people to rely on private medical insurance, or introduce new or increased charges for GP appointments or minor surgical treatment or prescriptions – then there’s only one choice at this election. 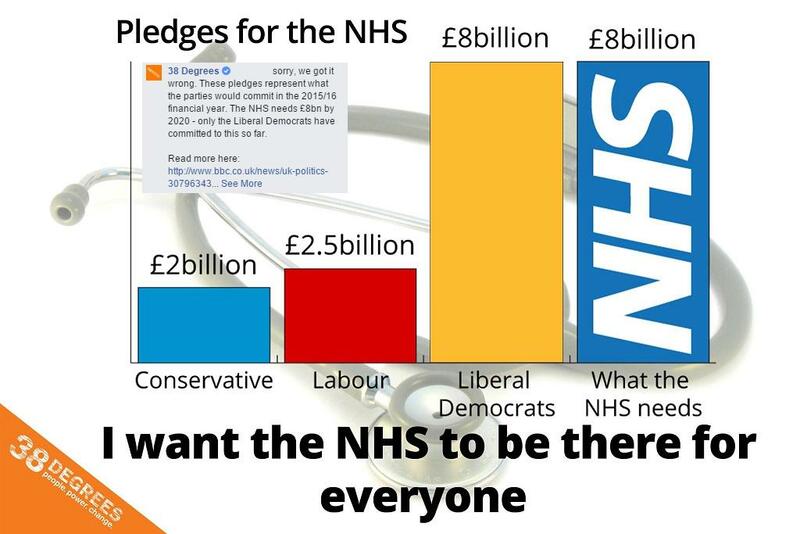 The Liberal Democrats are the only party that truly wants to protect the NHS.